Sir Isaac Newton was a great scientist who lived about 250 years ago (1642-1727). He figured out three important rules about how things move. The law of inertia says: objects don't want to change how fast they're going. They will only speed up or slow down if something pushes or pulls them. The heavier something is, the more inertia it has. The tablecloth pulls on the dishes when we move it. The dishes start out standing still. They don't want to speed up because of their inertia. If the tablecloth pulls on the dishes for a long time, they will speed up and move along with it. If the tablecloth pulls on the dishes very quickly, they start SLIPPING and don't get very far before the tablecloth is gone. The dishes can't slide on the table very well, so once the tablecloth is gone, they stop moving really fast. The dishes (with any luck) don't fall off the table! The tablecloth needs to be dry and laid out smoothly. Don't put dishes right near the edge of the table. Pull downward and out, NOT up and out, or up then down, or anything else. Do not do this demo unless you have practiced it thoroughly! This demo switches topics (from air) to Newton's laws. Ask the kids if any of them have ever heard of a scientist named Sir Isaac Newton. Tell them about Newton and what he discovered. We're going to talk about two of his three laws. Explain the concept of inertia. Show them the plates, and explain that they're heavy, so they have a lot of inertia. Since they're not moving, they won't start moving unless something pushes or pulls them. Pull on the tablecloth slowly and show that the plates move with it. When you move the tablecloth slowly, it pulls on the dishes enough to make them start moving. They get pulled along with the tablecloth. The law of inertia says if we pull the tablecloth out really fast, it won't be able to pull the dishes for long enough to get them moving. The inertia of the dishes wants to keep them standing still. 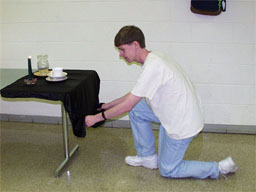 If you want, you can "experiment" by pulling the tablecloth slightly faster, but not enough to make the dishes slide. Get a countdown and then pull the tablecloth down and out really fast.